All this talk of diversity in books, yet where is the diversity in setting? Must every work of women's fiction be set in New York City? Can we have stories about people who aren't jaded, entitled and whingeing over trivialities? I slogged through one-third of THE INTERMISSION before I realized I was wasting valuable reading time on something not worth the investment. Again, yes again, the acquisitions editors at Penguin Random House have found another manuscript that speaks to them, young professionals in New York City with psychoanalysts on retainer, spending every waking minute analyzing the minutia of life and believing that these thoughts are deep, relevant, and of vital interest to the rest of the world. Our characters are a pair of well-heeled New Yorkers, five years into a marriage, and wouldn't you know it but the wife is up to the usual examination of her existence because she has little else to do. No one in these novels ever considers volunteering at a soup kitchen, to be surrounded by characters with far greater problems. That's not how modern publishing works. 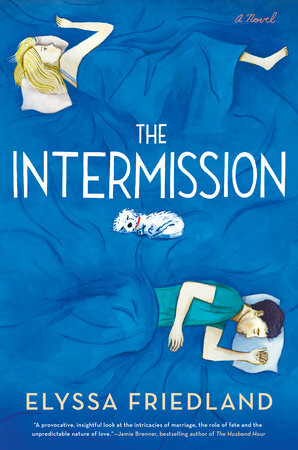 Poor Cass is so burdened by the weight of entitlement that she must take a break from marriage and so she proposes an intermission (not a trial separation. That's so last century). And where does she jet off to, to find meaning in her empty life? She doesn't land on Mother Teresa's doorstep. No indeed. Our Cass goes all the way across the USA to Los Angeles, that other bastion of entitlement. Where she finds an affordable flat in West Hollywood. Is this historical fiction, you might ask, or do the entitled think $2000 per month for a dump is affordable? But what of the novel? Does Cass find herself and heal her marriage? I don't care. I have given up on her tale of self-centered woe. I cannot finish this novel full of emptiness. Author Elyssa Friedland can string words together to make sentences, but that's not enough to compose an entire novel that is enjoyable or enlightening or entertaining. Diversity in publishing, please. There is an entire world outside of Manhattan, beyond Park Slope, and surely there is the next Ivan Doig seeking publication.